Jim Duvall, Karen Young and Angela Kays-Burden. 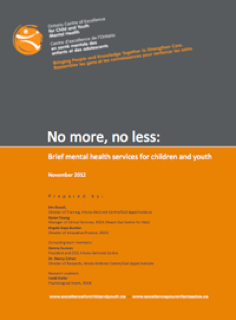 This policy paper offers an expose of the children’s mental health service delivery system in the Province of Ontario, Canada. The issues that were addressed and the recommendations that were made are also relevant to mental health service delivery systems in other countries. This project offered many innovative ways to improved the quality and efficiency of service in children’ mental health. As a result of the recommendations of this policy paper Brief Competency-Oriented Services (e.g. Narrative Therapy, Solution-Focused Brief Therapy and Collaborative Therapy) were mandated to be available to children and families in every community in the Province of Ontario.This policy-ready paper was commissioned by the Ontario Centre of Excellence for Child and Youth Mental Health.